and I've added slides from my 3 hour OSCON tutorial on gameplay providing further background detail. For more on this, you can get in contact with me at Leading Edge Forum. Though be warned, I do work for a large number of Governments and global organisations hence, I'm in the middle of a new research project (on predictability) and hence my time is sparse. So, a few things to note in order to help you along. 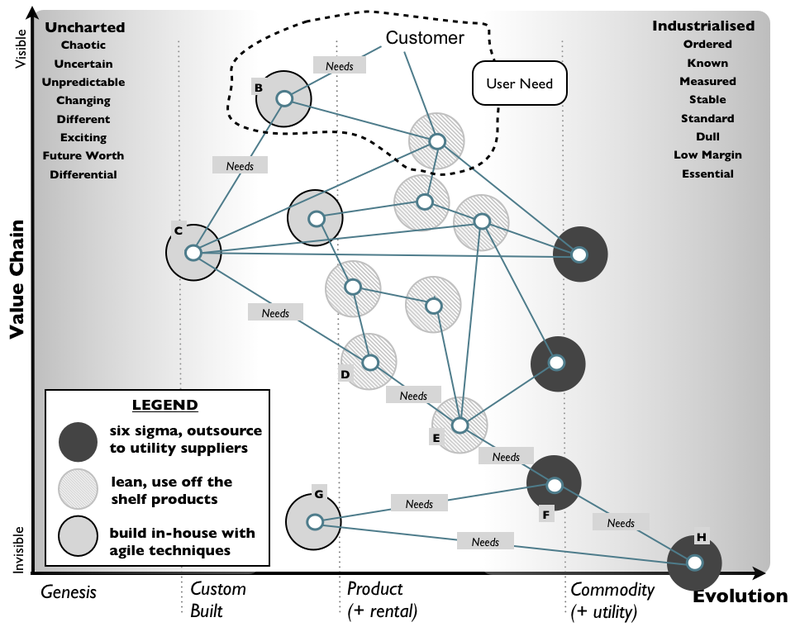 The mapping technique described above is used to create what are now becoming commonly called 'Wardley Maps' (to avoid confusion with other value chain maps / strategy map techniques). The technique is creative commons share alike. This doesn't mean you have to make your own company maps creative commons but rather that no-one is going to turn up and say you have to pay some license fee to a strategy consultancy for building one. I would ask that if you use this stuff then cite the technique as creative commons share alike. An example map is given in figure 1. The best way to learn about mapping is to start to build one and share it with others. I recommend just picking a system or line of business and having a go. Don't worry about making the map perfect, it's far more important to get feedback from others. I have a step guide here on the process of building a map and an earlier attempt at writing a book (actually the 3rd attempt) which starts here. Don't expect a book soon, I alas have very little time to write one. By all means, gain some experience in mapping and write your own. I've been doing this form of mapping from 2005 (almost a decade now) since I first developed the technique. Yes, it'll take time to gain experience in manipulating an environment but remember maps enable people to discuss an environment, they are not just about management techniques and scenario planning but organisational learning. I can't emphasise enough how important it's to just get started, once you get good then comparison between maps (both different business units and against competitors) is always useful. I don't provide consultancy work on mapping as I work for a private members only research organisation known as the LEF. If you are using mapping then I'd love to hear about it. You can either ping me on twitter or if you're happy to talk about experiences in public then leave a comment here. For those who missed the tutorial, I'll submit to do another talk at OSCON in 2015 - fingers crossed. Thanks also for all those who scored my tutorial and keynote. I'm very humbled by this and the kind comments. This is very much appreciated. How to navigate without a map? Four things that annoy me with strategy. IBM ... a cunning fox? Prime ... to be or not to be?